The basis for a healthy Christian understanding of the mind and the cure for what ails the soul, this profound work gives a true view of the inner working of the mind and heart from an Orthodox Christian perspective, rather than just modern speculations. 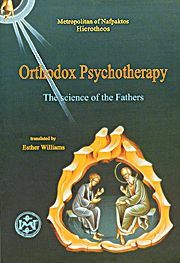 The study of the patristic texts and particularly those of the hesychast Fathers of the Philokalia, many years of studying St. Gregory Palamas, association with the monks of the Holy Mountain, many years of pastoral experience, all brought Metropolitan Hierotheos to the realization that Orthodox theology is a science of the healing of man and that the neptic Fathers can help the modern restless man who is disturbed by many internal and existential problems. Softbound. 368 pp.